The NSYC owns a full fleet of Kayaks exclusively for member use on Lake Michigan. Our diverse fleet can accommodate small to x-large size adult paddlers. New and experienced paddlers are always welcome. Kayaks are available for members use on a first-come first-served basis when boats are not reserved for classes or club Kayak outings and events. We take Water Safety seriously and require use of the “buddy system” whereby an adult member is present and two kayaks paddle together at all times, within shouting distance of each other. A secured, US Coast Guard Type III Life Jacket (Personal Floatation Device) is required to be worn on the water at all times. NSYC offers classes for beginners and seasoned paddlers including stroke & technique development, rescue skills and more. Each class is taught by our volunteer instructors who have been certified by the American Canoe Association, the nation’s premiere paddle sports organization. Members who use club Kayaks are required to complete the Intro to Kayaking course Part I & II, prior to use of club equipment. Kayak beachfront storage rental is available for residents and non-residents by contacting the Park District of Highland Park directly. See our Membership page for annual membership rates and full club benefits. Kayak classes are scheduled throughout the summer season. Dates and costs can be found on our Calendar under the Events tab. Kayak, Paddle and life jacket (PFD) is included. Pre-registration for each class participant is required through our Membership site. Classes are available to adult members, as well as those ages 13-18 yrs old when taken with an adult member. Registering for a Class or Event begins by clicking REGISTER NOW and logging into our Membership site. This is a two-part course with Part I on land only, and Part II on the sand and water, (Part I 1.5 Hours (Land only), Part II 3 Hours (Sand & Water). Learn basic paddle strokes, turns, essential equipment and gear care, including the paddle, PFD and kayak features. 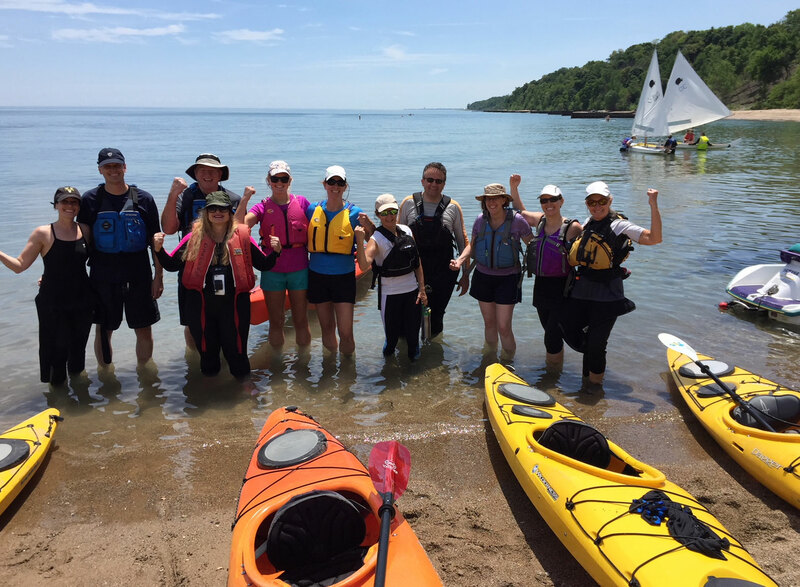 Participants will learn and practice basic kayaking skills and learn about water safety, assessing conditions and paddling on Lake Michigan. After both classes are completed participants will have the opportunity to pass the NSYC Kayak Paddle, Swim, Capsize and Assisted Rescue assessment that is required to use any NSYC Kayak equipment. Kayak, paddle and PFD are provided. Learn additional strokes (bracing, draw strokes, sweep, sculling, edging), and refine the strokes you know! Assisted and self-rescue techniques will be covered. The majority of class time is spent on the water. Prerequisite: Intro to Kayaking and paddling experience. Learn to safely empty and re-enter a kayak after capsizing in open deep waters through multiple rescue methods. These include self-rescues and buddy assisted rescue techniques. Participants will have the opportunity to practice and apply several rescue techniques on the open water. The majority of class time is spent on the water. Hone your existing skills and learn some new moves. Our 3 hour clinics will help members become more confident in the kayak and get around faster, with more power and less effort. The focus will be on developing efficient forward strokes and turns. We will also make time available in each clinic to develop or learn new skills that are requested by the group. Most of class time will be spent on the water. Come join us and let’s have some fun. Check our Events Calendar for Tuesday Full Moon Paddles which are lots of fun and very well attended so reserve a kayak as soon as registration for each event opens, or bring your own. Plan to join us on the clubhouse deck afterwards and bring your favorite snack or refreshment to share with the group for our delicious post-paddle Pot Luck!